Mere weeks after announcing it would shut down its 2G phone network, Japan's NTT DoCoMo has revealed plans to commence 4G operations next year. The company said this week that it would be ordering 4G LTE (Long-Term Evolution) hardware from Korea's LG Electronics for introduction in 2010. 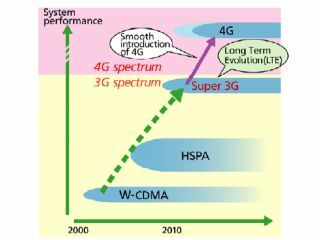 DoCoMo's 4G network will offer downloads at up to 300Mbps, further blurring the line between mobile connections and fixed domestic lines. And, as if that weren't enough, the company also said it will increase current 3G speeds to 14Mbps down and 5.7Mbps up. After that, the race is on to see which of DoCoMo and Verizon in the US will be the first to get their 4G network up and running.